The horrific hazards of surveillance—whether this side of the lens or that—is the connective trope between the World Premieres of Slumlord (2015) and Observance (2015) at the 19th edition of the Fantasia International Film Festival (Fantasia). Whether one believes that evil enters through the eye as a witness to atrocity, or that the voyeuristic eye itself commits atrocity, the eye becomes the fulcrum through which these criminal processes are understood. In Peter Marra's survey of the slasher film genre " 'Strange Pleasure': 1940s Proto-Slasher Cinema" (recently published in Recovering 1940s Horror Cinema: Traces Of A Lost Decade, edited by Mario Degiglio-Bellemare, Charlie Ellbé, and Kristopher Woofter, Lexington Books), Maara outlines the formulas strategically used to position audiences in relationship to onscreen antagonists, notably "the emphasis on a psychologically motivated human killer who functions unrecognizably in normalized society and elicits audience sympathy; the distinct association made by the film between its audience and the killer's perspective, specifically through the use of point of view shots…." (2014:27) Whether we "understand" Norman Bates' voyeuristic compulsions in Psycho (Alfred Hitchcock, 1960) and, thereby, ameliorate his pathology, Hitchcock nonetheless frames Norman's pathology in a stunning detail of his eye looking through a peephole at Marion Crane; the light from the other room illuminating his eyeball. It's his eye, what he sees, his motivated perspective on the world, that becomes the signifier of evil foreshadowed. Slumlord (2015, USA, dir. Victor Zarcoff)—The McManus Brothers Kevin and Matthew brought their directorial feature debut Funeral Kings to Fantasia in 2010 (to considerable acclaim), and have upped their game this year as producers for newcomer Victor Zarcoff's Slumlord, a study in terror that—Fantasia says—modernizes both Alfred Hitchcock's Rear Window (1954) and Michael Powell's Peeping Tom (1960) for our digital era. I would argue it's actually Hitchcock's Psycho that's at play here as so much of the film focuses on the jaundiced eyes of Gerald (the titular slumlord creepily portrayed by Neville Archambault) and his obsessive watching. The peephole in the wall has been updated to installed fiberoptics, but the act of voyeurism, and its calculated intentions, remain the same. Simon Laperrière observes in his program capsule that "the suspense of this hyperrealist thriller slyly unfolds, ascending to unbearable heights of anxiety. Neville Archambault portrays Gerald [the slumlord] with an intensity that instills fear from his very first appearance on screen. The narrative juxtaposition of home invasion and gripping conjugal drama is done to perfection." In an eleventh hour effort to save their crumbling marriage, Claire (Brianne Moncrief) and Ryan (PJ McCabe) move into a new home hoping for a fresh start. "Intimacy counts for naught", Laperrière notes, as—unbeknownst to them—their creepy landlord is methodically calculating their behavior via hidden surveillance cameras; an act not as uncommon as one might think. Statistics indicate that there are now thousands of cases of landlords spying on their tenants. The acting ensemble is tight, but what intrigues me is how their character flaws in a way serve to justify their landlord's actions. Claire is manipulative and needy, Ryan is a philanderer and a liar, and his love interest Hannah (Sarah Baldwin) is a bit of a stalker herself. They almost deserve to be spied upon and they're literally asking for their comeuppance. "Wonderfully acted by a cast straight out of a Tobe Hooper film," Fantasia asserts, "this domestic nightmare builds suffocating tension by exposing the fragility of our intimacy in today's world." World Premiere. IMDb. Facebook. 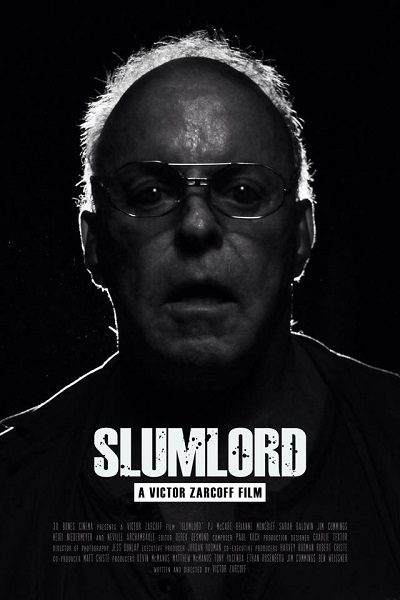 Slumlord Trailer (2015) Fantasia Film Festival from McManus on Vimeo. Observance (Australia, dir. 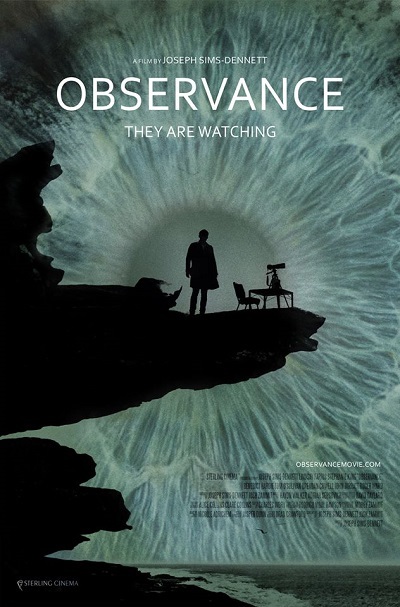 Joseph Sims-Dennett)—The eye returns in Joseph Sims-Dennett's Observance (and is featured prominently in the film's poster). Our protagonist Parker (Lindsay Farris) arrives to his new job, undeniably handsome but noticeably harried. He's been asked by a client to observe a beautiful woman Tinneal (Stephanie King), to take photos of her from across the street, and to record her daily actions. Although he's not too keen on the assignment, he desperately needs money. Thus begins this perplexing tale of a man manipulated by forces beyond his control incriminated into a ritual act he hardly comprehends. Purposely enigmatic, it's difficult to know what's going on in Observance (do you always understand your nightmares? ), and don't expect any kind of meaningful resolution wrapped up in a neat bow. With sufficient interest, this film warrants a second watch and considerable afterthought to comprehend what's just been seen; but, despite its (at times annoying) obfuscations, it offers significant scares, and a stylized descent into madness reminiscent of the films of Roman Polanski. Filmed in an admittedly disorganized 11 days, the film's true creative feat lies in Charles Ivory's layered, evocative editing, which melds a haunted past with a doomed present, juggling the diabolic with the quotidian, and instilling mounting dread as an unnamed, unknown menace begins to manipulate events. High marks to actor Farris who I could watch for hours, even spitting black goo into a bathroom sink. Observance may not be so much about a woman being observed, as we're first led to believe, as it is about noting an important ritual moment of insinuated black magic. World Premiere. Official site. IMDb. Facebook. Observance from Festival Fantasia on Vimeo.